Photo courtesy of Wright State University. Emily Vogelpohl paced the Raiders in scoring, but the green and gold fell to Belmont, Nov. 15, at Wright State University’s Nutter Center. 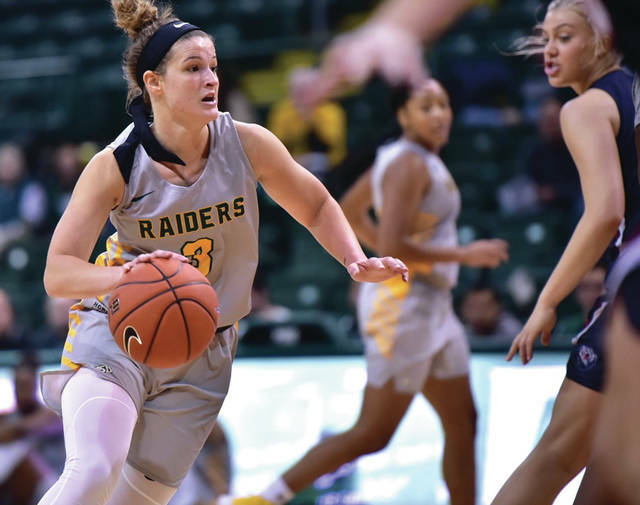 FAIRBORN — In their first home game of the season, the Wright State University Raiders women’s basketball team fell behind midway through the first quarter as they saw themselves out-rebounded 13-4. Belmont University, the Ohio Valley Conference favorites, proved to be too much as the Raiders were never able to cut into the Bruins’ first-quarter lead, only pulling within six for the remainder of the game. The Bruins went on to win, 79-63. The Raiders’ offense was led by Emily Vogelpohl with 15 points, nine of which came from behind the arc. Mackenzie Taylor added another 13 points and converted all of her eight free throws. Coming off the bench, Michal Miller also scored in double-digits, adding 10 points. After an early back and forth in the first quarter, the Bruins pulled away and gained a 12-point lead. By the end of the first quarter, the lead was up to 14 points. Miller put in two of her three attempts from 3-point range and totaled eight points in the first quarter. The Raiders opened up the second quarter scoring on four straight possessions, which included three 3-pointers from Vogelpohl. Wright State was able to cut the Bruins’ lead and draw within six points. Shots from behind the arc kept the Raiders close as they hit four of their 3-point attempts during the quarter. The highlight of the third quarter came when Angel Baker had a pick-pocket turnover which was quickly recovered by Anisja Harris and given back to Baker who finished the play on the other end and pulled the Raiders within 10 points of the Bruins. A majority of scoring came from the foul line for the Raiders, converting nine of their 15 attempts. Belmont’s ability to cover up the ball proved too much for Wright State as the Bruins were able to haul in four offensive and seven defensive rebounds. Wright State outscored Belmont in the second quarter, 18-16. The Raiders went perfect from the free-throw line, converting all eight of their free throw attempts. Bruins player and OVC Preseason Player of the Year, Darby Maggard scored a game-high 24 points. On Sunday, Nov. 18, the Raiders travel to East Lansing, Mich. to take on the Michigan State Spartans for a 2 p.m. contest. https://www.xeniagazette.com/wp-content/uploads/sites/32/2018/11/web1_womenRaiders.jpgPhoto courtesy of Wright State University. Emily Vogelpohl paced the Raiders in scoring, but the green and gold fell to Belmont, Nov. 15, at Wright State University’s Nutter Center.